Jacket # 7 - Andrew Joron - A review of Peter Gizzi's "Artificial Heart"
THERE IS A DARKNESS at the heart of Peter Gizzi's new collection of poems, Artificial Heart, that is far from artificial. It is the all-too-natural darkness at the center of being-there: an originary absence that, as in the myth of Orpheus, cannot be rescued by representation. Yet it is precisely the poet's task to undertake this rescue: Gizzi's work here follows the Orphic path of Spicer and Rilke. At the end of the path, the poet is left holding the heart of a necessarily artificial representation. 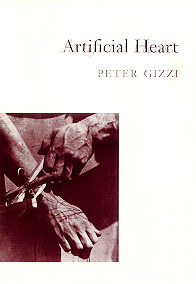 The title, Artificial Heart, is itself emblematic of this Orphic turn (where meaning is made to refuse its witness). At first, the phrase reads as an invocation of the cyborg, inspired by the headlines of a thoroughly technologized (and commodified) life-world. However, the book's range of reference defeats this expectation: the techno-quotidian is nowhere to be found within its pages. Instead, the title - abducted from a place in the "real" world, and exiled to the dim underworld of pure symbolism - accurately locates the site of writing as the "heart of artifice." At the same time, Gizzi's poems never lose sight of the vestigial trace of the "thing" within the "sign" (as the frozen face of Eurydice, vanishing under the Orphic gaze). Here, "things" are never completely reconciled to their status as signs, even if they are embedded within an elaborate armature of signification, a "renovated trobar," as Gizzi puts it. As revealed in his "Notes," Gizzi's texts are often crystallizations of a complex intertextuality, passing, like wheeling star-systems, through the systems of many other creators (including poets Spicer, Palmer, Creeley, Cadiot, Davidson, Shapiro, and Shelley; musicians David Thomas of Pere Ubu and David Byrne; and artists Manet, Trevor Winkfield, and Joseph Cornell). Thus, even the simple, concrete words used in poems like "Salt" and "Reed" do not point primarily to things but to previous signs (the poems in question are "mirror versions" of poems by Spicer). And yet, Gizzi's poems, even when they are most crowded by other signifying presences, seem also to be haunted - better, pierced - by something that absents itself, that can be signified only as a non-sign, or as the sign of nothing. Here, signs still appear to be circling around other signs, caught in the reflexiveness of a poem about poetry. Yet at the center of this circulation lies a "hollow" subjectivity, synonymous with a "heteronym," submitted (as in a "test") to the conflation of the rhetorical and the pathological within "forensic," and also to a "casino chip's" sense of risky contingency - all equivalent, finally, to a message transmitted from a far-away place ("a long distance call"). The essence of poetry is, in other words, a coldly stated state of emptiness: a condition marked by disjunct terms, by standards of argumentation or damage, by contingency and absence. at the heart is a great stillness in a tiny pocket . . .
where the wind will not cease . . .
what the teachers left unsaid . . .
Foremost among these "teachers," of course, are the poets named above, who serve as models and furnish sign-material for Gizzi's "echoes" and "transformations" (as such operations are called in his "Notes"). In the end, however, the teachers and their texts leave something at the heart of poetry "unsaid." The endless recirculation of signs leads only to "fatigue": the terminus of poetic artifice is an "empty lot" swept by the (naturally meaningless) noise of the wind. Is there, then, a relation of identity between the (sign-like) emptiness at poetry's heart and the (thing-like) drift of atoms in the void? Does creation happen ex nihilo? This question, of course, has many antecedents in theology and philosophy. One especially striking parallel to Gizzi's way of posing the problem occurs in modern number theory, where the "fatigue" of iteration (counting from one to infinity) is founded upon - and initiated by - the empty set, just as the definition of the "heart of poetry" here is predicated upon an "empty lot." There is a concept, identical with zero, and an object falling under it, zero, such that the number which belongs to the concept identical with zero is 1, and the number which belongs to the concept identical with zero but not identical with zero is 0. 0 is the number of things that belong to the set non-self-identical; 1 is the number of things belonging to the set identical with zero; 2 is the number of things belonging to the set identical with 0 or 1; and so on to infinity. At zero hour an earth unwrites itself. Zero's "indefatigability" here stands in contradiction to previously-cited testimony about the "fatigue" at poetry's heart (though it seems that both writing and "unwriting" crucially concern issues of vital expenditure); however, this contradiction is already prefigured in the paradox of zero's plenitude itself: at the heart of poetry there lies an empty set, something whose presence is identical with absence. a = a: /no/ is /no/. and can a figure ask in daily usage? In these lines from the long poem entitled "Zero Elegy," logical and linguistic notation is used to assert that, in our current codes of meaning, the postulate of identity ("a = a") is homologous to the self-equivalence of the word for negation ("/no/"). In other words, to assert identity is to utter a denial (by implication, of identity). The sign of non-identity is "the question at the center" of being and language. Yet this zero-sign also constitutes a presence, a thing in the shape of an absence, "an object vanished from memory." Object divides from subject (or the subject becomes an object) here at the center of vanishment: the site where memory's iteration of the same ("a = a") is denied ("/no/") is in fact the birthplace of self-consciousness, where an "asking figure" comes to "find itself" (while remaining implicated in - "surrounded" by - the codes of "daily usage"). Photo: Tina Modotti, "Hands of the Puppeteer", 1929, courtesy the Minneapolis Institute of the Arts. "Can a figure ask in daily usage?" The figure's asking is itself framed within a meta-question about the completeness of ordinary language: can "daily usage" loop back on itself to give a meaning to its own ability to give meaning? Or is there an unaccountable emptiness in the midst of this self-surrounding code, a central, "unsaid" singularity that defines the orbit of the sayable? it does not pronounce itself. The form of Gizzi's poems is given by this figure of the "ruined motion" of signs, spreading outward from zero to infinity. What is more, the decay of the intersecting ripples creates signs out of other signs: "As things decay they bring their equivalents into being" (Spicer). Like star-systems in dispersal, Gizzi's texts often intersect with, and pass through, the works of others: they are "performing bibliographies" (see his poem "Ode: Salute to the New York School" in Chain # 4 ) showing that literary meanings and traditions "survive primarily in the ruins of the texts they leave behind" (as he states in an accompanying note). Although an important part of Gizzi's poetic art involves reprocessing signs through other, already highly processed signs, his word-choices are, by contrast, simple and direct: "All the while birds / exist in daily usage." Nevertheless, the "object" is fated to appear under the aspect of the sign of "vanishment": the lexicon of ordinary objects in Artifical Heart is cross-referenced to "hollow/hallow places that inscribe themselves" (to quote from the book's "Notes"). Whereas Spicer wanted "to make poems out of real objects," and "to make a poem that has no sound in it but the pointing of a finger," Gizzi's poems point toward an "object memory" that is "empty." All terms terminate here, in "the late mechanics of the heart." Spicer's aim, articulated in After Lorca, was to disclose "real" objects in "a structure of words." According to Spicer, things imprisoned in a poem nonetheless remain liable to "decay." In an outward-spreading motion (similar to Gizzi's zero rippling infinity), the defunct "real still reaches out into the current world making its objects, in turn, visible . . . . Things do not connect; they correspond." For Spicer, in other words, things behave like signs. In Gizzi's poems, in contrast, das Ding resists accommodation to the sign (one of his poems is wittily entitled "Ding Repair"). Rather, Gizzi's work reveals the hole inherent in the whole: for it is precisely the thing's absence (what a Lacanian analyst would call "the Other's lack") that sets the signifying chain in motion. The hollow heart of poetic artifice is situated here, where thing interpenetrates sign in a paradoxical relation. The repeated invocations of hollowness, emptiness, absence, and loss in these poems may be read as so many orisons to the "indefatigable" power of zero: for zero is unique in its ability to function simultaneously as both a thing and a sign. As Frege attempted to show in The Foundations of Arithmetic, all numbers - including zero - are "self-subsistent objects." Their self-subsistency is of the same nature as that of other objects: they are identical to themselves. Any non-self-identical object is naught: it is this very condition that necessitates zero's self-presentation as absence. At the same time that zero performs the work of "no thing" in relation to other things, it also stands as the sign of no thing. even, a lighthouse has its seasons too. the empty into which we move real. In "realizing" emptiness, the poems start a flow of current, a darker circulation within the darkness-and in doing so, initiate a movement toward regeneration, if not redemption. At such moments, Gizzi's poetry rings with a tonality of - a totality of - loss and longing that brings it in proximity to that of Rilke. Tellingly enough, this final poem is entitled "The De-Evolution of [the Name of] the Father" (my insertion). In Lacanian terms: the subject's assumption of the Other's lack enables the self to win free from an immobilizing subjection to Otherness and to achieve agency as a desiring subject (for desire is coextensive with lack). Once lack is internalized, the subject can traverse the displacements of the symbolic order, and enter into Language. Gizzi's poems thus amplify the signal of an ever-receding Euridycean radio-source: desire's own Emanation. In the late mechanics of the heart, zero bears a strong resemblance to infinity. ¶ in the UK - Spectacular Diseases, 83-B London Road, Peterborough, Cambs, PE2 9BS, England. Andrew Joron is the author of Science Fiction (Pantograph Press, 1992) and The Removes (Hard Press, 1999). He is also the translator of German philosopher Ernst Bloch's Literary Essays (Stanford University Press, 1998). He lives in Berkeley, California. 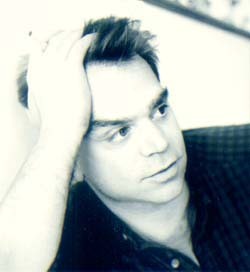 Peter Gizzi was born in 1959 and grew up in Pittsfield, Massachusetts. His publications include Periplum (Avec, 1992), and the chapbooks: Hours of the Book (Zasterle, 1994) and Music for Films (Paradigm, 1992). His editing projects have included the celebrated "little magazine" o-blek: a journal of language arts (1987-93), the international literary anthology the Exact Change Yearbook (1995), and The House That jack Built - the Collected Lectures of Jack Spicer (Wesleyan, 1998). He lives in Santa Cruz and teaches for the University of California.